The designated Prime Minister Andrej Babiš said that the European Union should back off from their threat to take the country to court over their refusal to accept migrants from Greece and Italy. “The Commission can withdraw the charge at any moment. We have to negotiate on this and to offer different models, like guarding the borders or help to other countries. But we don’t want any refugees,” Babis said in an interview published on Saturday by the Pravo daily paper. ** The Czechs and other members of the V4 simply cannot accept EU migrants from other countries. As we detailed earlier, both Greece and Italy refused to allow the Czechs to conduct proper security checks on the migrants. This is a matter of security and sovereignty, not political correctness masquerading as solidarity. Moreover, the EU’s relocation program failed miserably with many officials now admitting quotas are impractical and divisive. Many of the “refugees” quickly migrated to Germany, which unintentionally lures the migrants with generous welfare benefits and soft supervision. Despite the manipulation of the media (including a very biased and unprofessional Reuters), the Visegrad nation states must be given credit for reducing the flow of migrants to Germany and Central Europe, curtailing the migrant demand for Greece and protecting all Europeans from the many dangers associated with open borders and illegal migration. They have certainly done their part and much more. It is quite ironic that Germany is now dependent on Hungary, Visegrad and the Central European Defence Cooperation (CEDC) to secure their borders. We don’t hear any more “not my Europe” slogans from Angela Merkel regarding the Balkan closing. *** Under Hungary’s leadership, the V4 Group will establish a joint initiative to strengthen the protection of the Libyan border. This will involve up to €35 million euros. The Czech Republic and others have already provided funds to help train the Libyan Coast Guard. The Czech Republic is also participating in a joint project with Italy involving the Ivory Coast. The Czechs have provided 26 million crowns to help return the migrants and to provide health care services. 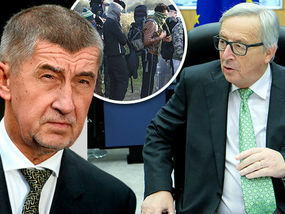 The Czechs, Hungarians and Poles have no other choice but to reject the blackmail of Brussels. Once relocation quotas are accepted or acknowledged, the EU will press for more in the future. This is how it works in Brussels. The EU program must be unconditionally defeated. The nation states of Visegrad have better and more efficient methods of protecting Europeans while helping the true refugees closer to their homes. Ireland: Amnesty International ordered to return a large donation from George Soros and Open Society Foundation.